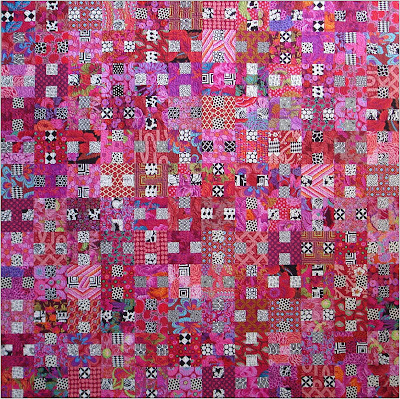 Founded by Amy Walsh and Janine Burke in 2005, Blue Underground Studios' mission is to publish quilt patterns that allow all quilters, no matter their skill level, to make fantastic looking quilts. Based in the heartland, near Chicago, they offer a wide variety of contemporary quilt patterns, kits, and workshops that are designed with today’s busy quilter in mind; many are suitable for use with jelly rolls or other pre-cuts. 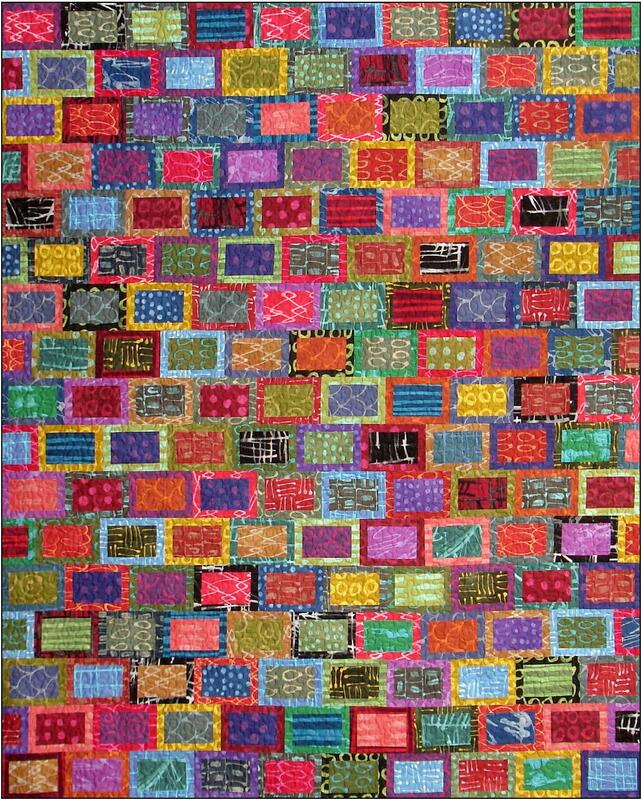 We like their simple shapes and colorful quilts. Nothing says "cozy quilt" to us as much as a shape resembling a nine patch, especially in these romantic, engaging pinks and lavenders with a little black and white added for spice. This block certainly must be one of the most beloved and best known ones ever. The "i Candy" pattern features straight strips instead of squares on the outside, so it's even simpler than the traditional block. Using 2 1/2 inch strips, it's easy to cut and piece. 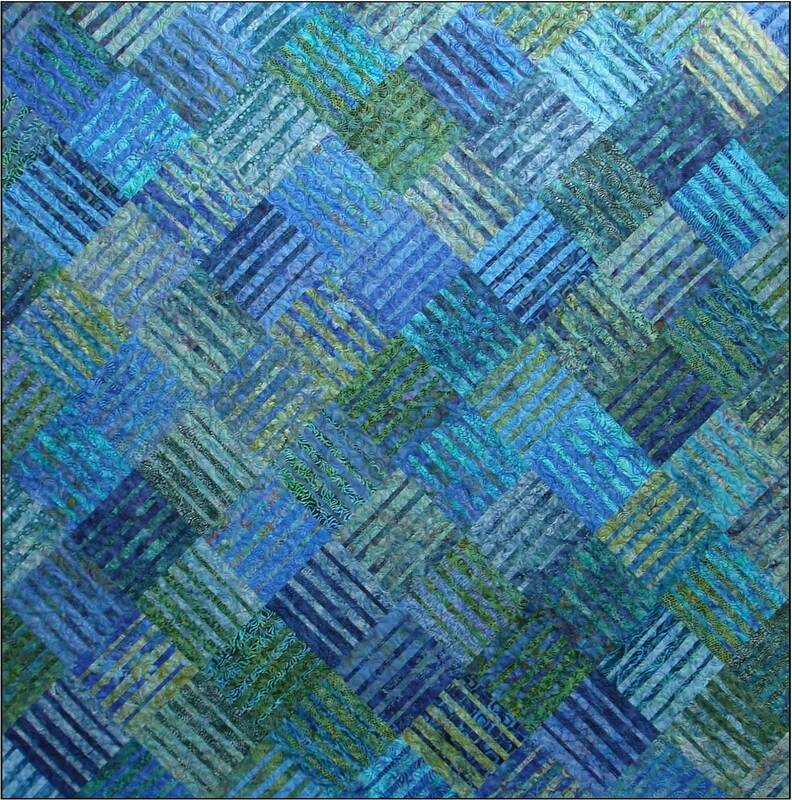 As with all Blue Underground patterns, the top goes together quickly; several quilt sizes are included in this fun pattern. Monochromatic shades of serene, yet dazzling blue make some of the loveliest quilts known, and the uplifting shades here are no exception. Janine Burke has fashioned a modern update on the Amish fence rail pattern by designing the strips in varying widths, then piecing them from narrowest to widest. This pattern contains a very interesting optical illusion, as the narrowest strips seem to be triangular and pointed, almost like a Mariner's Compass; however if you study the pattern, you will see that they are the same size from one end to another. 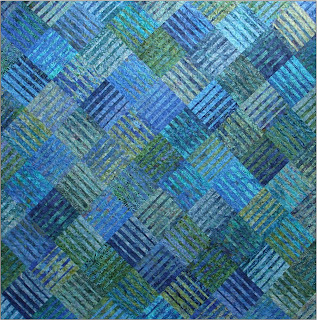 Janine's "Underground Blues" pattern would look equally stunning using contemporary batiks or traditional calicoes. Amy Walsh writes on her fascinating blog, True Blue Quilts, that she has been sewing since she was old enough to hold a needle. 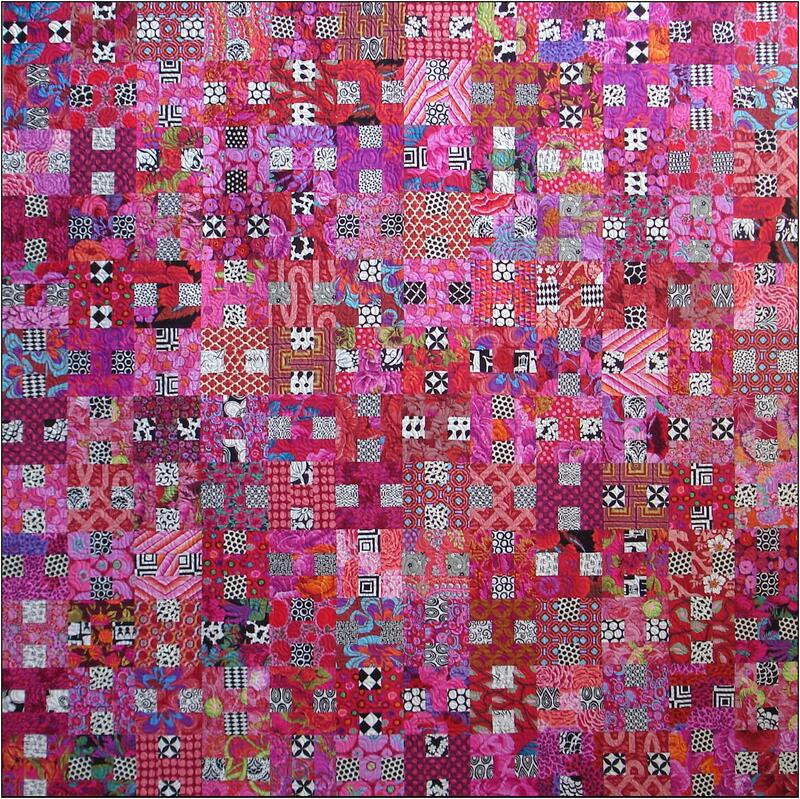 She worked as an educator and a long arm quilter before establishing Blue Underground Studios . Her pattern above, "Brix", was just released for Spring Quilt Market 2011 in Salt Lake City. This design is great for using up small pieces of fabric in complementary colors, or for showcasing any collection of fabrics by piecing high-contrast values next to each other. Thirty fat quarters are required to make the cover quilt. I love these three quilts! It's amazing how color can transform a simple design into something spectacular.